Well, Trey had an okay night. He is obviously very sore and battling pain from the surgery. We are keeping him comfortable with pain meds though. We hope that in a day or two, ALL his tummy pain is gone. Something interesting, and we are not sure what to make of it yet, but Trey’s platelets jumped up to about 140,000 over night. They have been as low at 10,000 last week. I cannot remember, if ever, Trey’s platelets being that high. They are almost in the normal range (152,000-348,000 is normal). His white blood cell count is also at 3,000. It’s been at like 100-200 the last few weeks (4,000-12,000 is normal). We, of course, do not make too much of anything right now, but those are good things to celebrate…even if they are temporary. We will just have to see what his numbers do over the next few days and weeks. We, of course, are still wanting to see improvement in Trey’s skin. It would be awesome, if with this healthy cell production, that the good cells would help fight off these bad cells in the skin. We don’t expect that to happen, but it sure would be nice. We will continue to give medicine to help battle the abnormal cells in the skin, but a little help from his own good cells would be wonderful. Once again, we will just have to see what happens. So…there is much to wait on right now. I still feel that, no matter what, removing the spleen was the right decision. I think it will only help Trey. Please just keep lifting the little guy up, mainly for him to be free of any pain. That would be such a lift to his spirits. He is resting right now, and we are waiting to see the doctor. I’m just hoping for a nice, relaxing, pain-free day for the little guy. Trey’s spleen was 3x’s times the normal size…so we are glad to get it out. We won’t know any of the specifics of what was in the spleen until next week We have to wait for the pathology report to be run. Trey will likely be sore for 2-3 days and then we hope to see some relief to his tummy pain. So, we will probably know by the weekend if the removal of the spleen helped with his pain any. We also hope to see some better hemoglobin and platelet production with the spleen being gone. As I’ve said before, we don’t think the removal of the spleen will help stop the LGL, but we do hope it helps Trey move toward the next transplant quicker and healthier. We shall see. Emily and I both think Trey’s skin is looking better. He’s peeling terribly and it’s extremely dry, but it’s lighter. We hope his skin just gets better every day. Please keep praying. These are important days for Trey. Thanks everyone! Doctor just came out and everything went very well. He called it a successful surgery. We will be going back soon to see Trey. In time, we will see if it helps Trey. We pray so. Surgery is a go. Not sure what time, but it will be sooner than later. Please pray. Ill keep you updated as I can. Trey has not had a fever since June 17th and he started running one this morning. The doctors are trying to decide if they should proceed with the surgery today. Please pray for wisdom. We believe the spleen needs to come out, but don’t want to put Trey at more of a risk than he already is. We just need wisdom! Even though the removal of the spleen is generally a relatively simple process, for Trey it’s a touch more complicated. The two big concerns for Trey are bleeding and infection. Trey’s platelets are low, but he will have received three platelet infusions over the last two days by tomorrow morning. We hope that helps with any unwanted bleeding. He is also highly immune compromised, thus leaving him more open to infection. 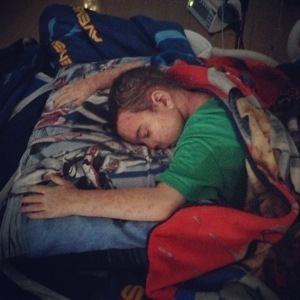 Our doctors have done everything they can to get his body ready for this by giving certain antibiotics and other medicines, but Trey will still be immune compromised more than we want when it comes time for the surgery. We are praying he is protected by the Lord from any infection. Join us in this prayer. The hope behind this surgery is that Trey’s tummy pain will be relieved and that with the removal of the spleen the rest of the abnormal cells we haven’t been able to get to, can be destroyed. We also hope this helps give room for good cells to grow. The removal of the spleen will not do away with the large granular lukemia (LGL), but we hope it helps Trey move to the next transplant as healthy, and as quickly as possible. This, however, is where we rest in the Lord. We’ve done all we can, as have our doctors, and we leave the details and results in God’s hands. This is totally out of our control and Trey is in the best place possible…in the hands and arms of our mighty God. We know God is holding Trey and we know that in all things, our God is in control. I probably won’t post again until after everything is done tomorrow, which we hope will be around 1-2pm. We know you are praying with us and we are grateful. We’ve had so many texts and messages from people today letting us know they are with us…and it has been very encouraging to our heart. Keep them coming…especially Scriptures of encouragement. We need it! We love you and are resting tonight and tomorrow in a sovereign and loving God who has ALL things in His hands…which of course includes our precious son. Trey, we love you! You are a God’s and He is holding you. Your mom and dad will be with you every step of the way too. We are all in this together and our God has a tremendous plan for all of us in this. We love you more than you will ever know Trey, but not anywhere close to how much your Lord and Savior, Jesus, loves you! Hold on Him Trey in all things…He is the only one worth living for. I love you son! 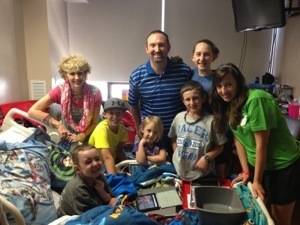 We are all here for Trey’s surgery tomorrow! He’s very happy. We’ve been watching funny Trey videos since we’ve been here. We love watching Trey laugh! Trey’s Surgery is a go! Trey is all set to have his spleen removed this Wednesday at 11am. Please be praying this surgery goes well and helps Trey tremendously. We know you will be with us in prayer and we are grateful! I’ll update you as we get closer to surgery. Thanks.